Today I went to the post office and saw my favorite two things: an eBay bubble mailer and a surprise bubble mailer. The surprise came from Chris at Stale Gum and was awesome of him to send me something out of the blue. 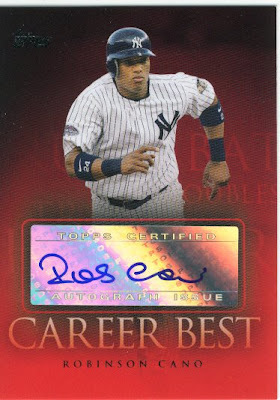 I had my eye on these Cano auto's watching to see where most of them ended and they were fairly reasonable (less than $10) for the most part. I ended up getting mine for $5 which seems to be below the average selling price, which is awesome for me. Now, I show it to my mom and she's like, "You hate Matsui." Yes, I do and that is why I was laughing in the first place. 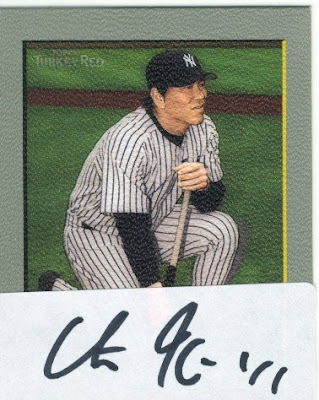 Chris made me day because his autograph is more valuable to me than Hideki, but this is all a story for another day. I don't believe I mentioned this to Chris, but you made my day with that card being signed. 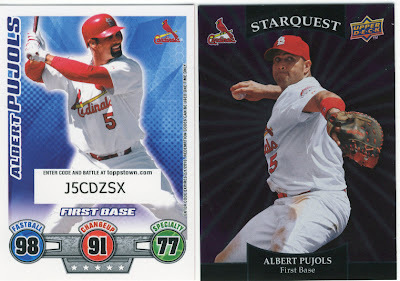 Chris also included 2 Pujols cards, and a nice chunk of YSL cards. Let the rummaging begin to find some stuff for Chris. Thanks dude! Now I have to move onto the not so fun part of collecting, logging everything in. The sad thing is, collecting would be really hard without this aspect of it. Who knows how many doubles and triples we might end up purchasing or trading for without a list of some sort.